Avaya IP500 Digital Station 30 | Comtalk Inc. The Avaya IP500 Digital Station 30 external expansion module is supported by IP Office Release 9.1. Each module uses an external power supply unit and power cord for the PSU must be ordered separately. The external module can be stacked on top of the control unit. They can also be wall or rack mounted using one of the IP Office mounting kits . Systems running in IP Office Basic Edition modes support up to 8 external expansion modules so long as the system extensions limit is not exceeded. Systems running in IP Office standard modes support 8 external expansion modules or 12 if the control unit is fitted with an IP500 4-Port Expansion Base Card. All phones offers high-quality audio and support VPN software for remote working. phones support up to 3 SBM 24. 1603: Backlit display, 2 rows of 16 characters, 3 programmable feature keys with red/green LEDs that give the user easy to read status information. 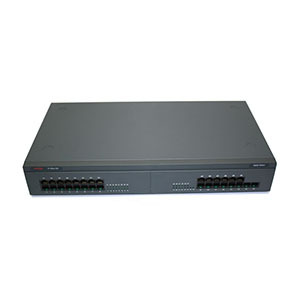 1603 SW: As 1603, but also has a second 10/100 Ethernet port and an integrated switch. 1608: 8 programmable feature keys with red/green LEDs, integrated headset interface, 3 rows of 24 characters. 1616: 16 programmable feature keys, BM32 port, integrated headset interface, 3 rows of 24 characters. 9504/8: Backlit graphical display, 4/8 programmable call appearance or feature keys with red/green LEDs usable in three states, headset socket and hands-free features. Model 9508 supports the BM12 expansion module. The Avaya 1400 range of phones is aimed at companies that want a simple, inexpensive communications solution for their digital network. Backlit displays, programmable keys with dual-state LEDs (red & green) for easy to read status information. Model 1416 supports the DBM32 expansion module. The Avaya IP500 Digital Station 30 (700426216) sells in Refurbished Condition and as always it will be delivered in A++ condition. For more information visit our Library for Avaya IP500 Digital Station 30 (700426216). Email us at sales@comtalkinc.com or Call us at 800-955-6082.